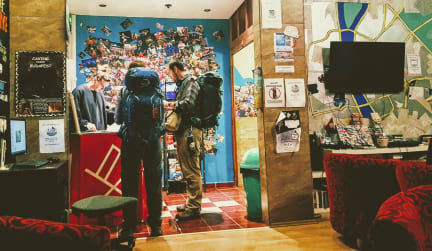 Meander Hostel i Budapest, Ungarn: Reservér nu! Really friendly atmosphere, and all the staff seem fully interested in making your stay an amazing one. Everything was great, loved the boat party! Great hostel, really enjoyed our stay. Would definitely come back another time. Super friendly and joyful staff. Nice location aswell. The hostel itself is party free but nightlife activities are planned for every night which are definitely recommended to tag along for. They are well organized and super fun. The quiet atmosphere at night makes it perfect for a good nights sleep after a night out. Shared kitchen facilities and relaxed vibes.